As you step foot onto Brighton's Palace Pier, you are overwhelmed by the sound of repetitive arcade music and the inviting scent of popcorn or fried fish. A row of stalls selling fast-food, toys and souvenirs leads visitors towards the arcade, which is filled with an assortment of gaming machines and a couple more eateries. This opens out onto the funfair section at the end of the pier, where a number of rides - including a Ghost Train, Dodge 'Em Cars and a lovely Carousel - attract quite a crowd. 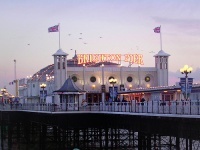 A great place for both kids and the young-at-heart to spend the day, Brighton Pier is also a wonderful spot to set up one of the iconic striped deck chairs and just take in the view and soak up the atmosphere.